One of ADJ’s best-selling products over recent years is undoubtedly the Inno Pocket Spot. 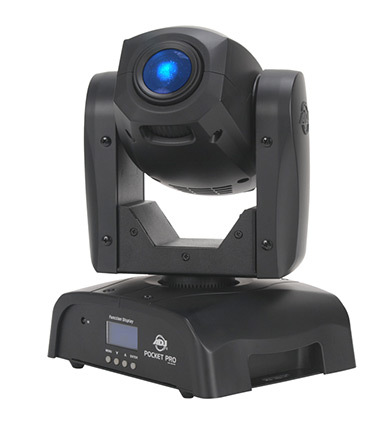 This lightweight, compact, and incredibly affordable fixture brought moving head lighting effects within the budget of many mobile entertainers and small venues for whom this type of lighting had previously been unattainable. Now we are pleased to announce the next evolution in small-format, low-cost moving head fixtures, the ADJ Pocket Pro. Building on the success of its predecessor, this new ground-breaking fixture offers increased brightness and the addition of interchangeable GOBOs with only a slight increase in size and weight, and NO increase in retail price! The new Pocket Pro utilizes a bright white 25-Watt LED light-source, which offers twice the power of the original Inno Pocket Spot (which had a 12-Watt LED). The light from this potent LED is then focused through an advanced optical system to create vivid surface projections and impactful beams of light that belie the unit’s compact form. 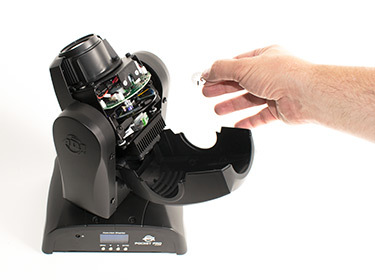 Not only does this new and improved fixture provide incredible output, it also offers replaceable GOBOs. This is an advanced feature that is unprecedented on a moving head of this size and at such a low price-point. The unit is fitted with a 7 position (+ open) GOBO wheel pre-loaded with a collection of detailed patterns some of which are particularly suited to surface projection while others are ideal for creating mid-air effects. However every one of these GOBOs can easily be replaced thanks to the unit’s easy-access hinged-case design. Once the fixture has been opened up, the pre-installed GOBOs can easily be slid out and replaced with alternative patterns. Four useful additional GOBOs – including one depicting a pair of rings surrounded by a heart that is perfect for wedding celebrations – are supplied with the unit, while custom patterns can also be used. The fixture is compatible with any metal GOBO with an outer size of 18.4mm and a visible area of 13mm. The fixture features a separate color wheel, which is loaded with seven vibrant color filters (plus open white): red, orange, yellow, green, UV, blue and pink. Further control over the unit’s output is also provided by a 0-100% digital dimming function, with five selectable dimming curves, and a digital shutter function which provides variable speed strobing (between 0.3 and 19Hz) as well as random pulse effects. With a beam angle of 15-degress, the Pocket Pro is ideally suited to creating mid-air effects and projecting patterns in small-to-medium-sized venues. It is fitted with a manually adjustable lens that can be used to ensure sharply-focused GOBO projections at varying distances. Just like its predecessor, the Inno Pocket Spot, the new Pocket Pro is incredibly compact and lightweight. With measurements of just 6.37” x 7.87” x 11.30” / 162 x 200 x 287mm (LxWxH), the unit requires little storage space when used as part of a mobile lightshow and can be permanently installed into venues even where ceiling height is limited. With a weight of just 7.3 lbs. / 3.6 kgs. the unit is easy to carry and rig, using either its rubber feet or the supplied Omega mounting bracket. The fixture’s moving yoke offers a wide pan range of 540-degrees as well as 230-degrees of tilt movement. 16-bit motors allow for smooth movements and accurate positioning, while the unit’s small size and low weight also mean that it is capable of lightning-fast movements. When it comes to control, the unit offers a wide variety of options. It has three operational modes – DMX, Sound Active and Internal Show – which can easily be selected from the 4-segment LED display positioned on the front of the fixture. A choice of four separate pre-programmed sequences can be selected for the Internal Show mode, while a choice of two channel modes (11 or 13) is provided for DMX operation. Multiple fixtures can also be linked together for Master/Slave operation – in either Sound Active or Internal Show mode – and the unit’s Pan/Tilt Inversion feature can be used to create contrasting movements for added excitement. The fixture is also compatible with ADJ’s UC IR infrared wireless remote as well as the Airstream IR iPhone / iPad control system (both sold separately). The unit is fitted with an upgraded powerCON power connector on the rear panel that locks into place. So, there will be no worries about a power cord unplugging from the unit. Building on the success of the original Inno Pocket Spot, the new Pocket Pro is the ultimate compact and affordable moving head. Offering powerful output from its 25-Watt LED and an expansive feature set – including the game-changing replaceable GOBO wheel – it is ideal for mobile entertainers, small clubs and bars, roller rinks, bowling centers, and any mobile production. The Pocket Pro will be available end of August 2017 from ADJ USA, and end of September 2017 from ADJ Europe.